Bob Manno, a Niagara Falls Boy, was an outstanding young athlete. He won several individual awards, while playing for championship baseball teams that represented our City. His skills as a hockey player were exceptional enough to earn him a position with the Niagara Falls Flyers Tier II Junior "A" Team when was only sixteen years old. 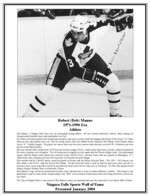 The following season, Bob was drafted by the Hamilton Red Wings of the Ontario Major Junior "A" Hockey League. He played one season there and two more seasons when the team moved to St. Catharines and were known as the Black Hawks. Bob was selected 26th overall in the 1976 National Hockey League (N.H.L.) draft by the Vancouver Canucks, where he played for five years, playing over 200 games. The following year he signed as a free agent with the Toronto Maple Leafs. His phenomenal season with the Maple Leafs earned him selection to the 1981/82 N.H.L. All-Star Game, that was played in Washington, D.C. While there, team members met and were honoured by President Ronald Reagan. Bob decided that his 1982/83 season would be played in Europe with the Italian National Team. The 1983 - 1985 seasons saw Bob return to the N.H.L. with the Detroit Red Wings. Europe lured him back to play in Italy for nine more years and also to become a head coach at the Elite Level for an additional seven years (five in Italy, two in Germany). Bob Manno’s long, illustrious professional hockey career allowed him to play in sixteen different countries. Bob found it very gratifying to play in seven world championships, win "Best" at his positions awards many times and being selected to several all-star teams. 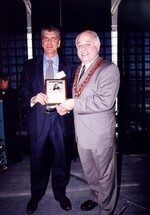 The City of Niagara Falls is very proud of Bob Manno’s many accomplishments and welcomes him to our Sports Wall of Fame.